TORONTO – It’s been nearly four weeks since the Toronto Raptors made the controversial decision to fire their head coach, Dwane Casey, and while the search for his replacement is still ongoing the team appears to be leaning towards a familiar face. 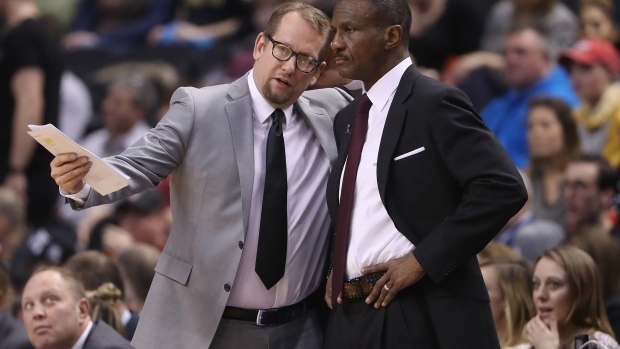 Toronto assistant Nick Nurse remains the favourite to land the Raptors’ vacant head coaching job, league sources tell TSN, though several external candidates are also being considered, including San Antonio Spurs assistants Ettore Messina and Ime Udoka, as well as Sarunas Jasikevicius, a rising star in the EuroLeague. Nurse was among the first interviewed by team president Masai Ujiri and general manager Bobby Webster in the middle of May, the week after Casey was let go. The others in that initial group have either been hired elsewhere (former Hawks and current Bucks head coach Mike Budenholzer) or are believed to have lost traction in the evaluation process (Raptors assistant Rex Kalamian and Raptors 905 head coach Jerry Stackhouse). More recently, the Raptors met with Messina, Udoka and Jasikevicius (as first reported by ESPN) – all of whom are said to have made strong impressions on Ujiri. From the get-go, it was clear that Ujiri would consider candidates of different coaching backgrounds and levels of experience. Messina, 58, joined Gregg Popovich’s staff in 2014, fresh off a decorated international coaching career that saw him win four EuroLeague championships. Long considered one of the best coaches in the world, even before coming to the NBA, Messina’s resume and no-nonsense approach commands respect. Udoka, 40, finished his seven-year NBA playing career in San Antonio during the 2010-11 campaign and quickly transitioned to coaching, joining the Spurs staff as an assistant the following season. He has a prior relationship with Ujiri, having coached at his Giants of Africa basketball camps. Like Udoka, Jasikevicius is an intriguing coaching prospect. The 42-year-old Lithuanian appeared in 138 games for the Pacers and Warriors between 2005-2007, but the former point guard is best known for his playing career overseas and with the national team. He joined the Zalgiris bench immediately after retiring in 2014 and took over as the head coach of the Lithuanian team the following season. With the second-lowest budget in the EuroLeague, Jasikevicius led a team that included Canadian point guard Kevin Pangos to the Final Four and a surprising third-place finish this past year. While having NBA head coaching experience is not believed to be a prerequisite for Ujiri, evident by the list of candidates he’s considering, he is said to be prioritizing overall coaching experience. That’s a factor that separated Nurse from the younger and less experienced Stackhouse, and one that could give him an edge over Udoka and Jasikevicius. Nurse, 50, has been in coaching for 30 years, having had success at every stop along the way. In the British Basketball League he won two championships and a coach of the year award. In the NBA G League – formerly the D-League – he also won a pair of titles, with two different teams, and earned coach of the year honours. Regarded as a bright and innovative basketball mind, Nurse joined Casey’s Raptors staff in 2013 and was tasked with overseeing the team’s offence. Alongside Casey and with guidance from the front office, Nurse had a hand in transforming Toronto’s offensive approach last season. Emphasizing more man and ball movement, as well as more outside shooting, they went from dead last in assists the year before to sixth and took the third-most threes in the league (up from 22nd in that category). Even as their defence fell apart in the playoffs, leading to their early and disappointing postseason exit, those offensive changes mostly held up. To this day, the Raptors own the second-best offensive rating in the playoffs, only trailing the Warriors, who are two wins away from winning their third championship in four years. Of course, Nurse shouldn’t be immune from criticism for the way this season ended, and the team’s past playoff failures. He shares in the blame, as everyone in the organization should. However, with most of the core likely returning for next season, including all-stars DeMar DeRozan and Kyle Lowry, he might bring the desired combination of new approach and familiarity with the system. Not unlike the decision to fire Casey to begin with, promoting an internal candidate would be polarizing. But, in Nurse, the Raptors believe they have one of the league’s next great head coaches, and they’re not alone. In early-April, just before the end of the season, Yahoo polled over 30 high-ranking NBA executives to see who the top head-coaching prospects are among the league’s assistants. Nobody got more votes than Nurse. By passing on him here, the Raptors could lose him altogether. That Ujiri is taking his time and doing his due diligence comes as no surprise, given his track record of being patient and the importance of this franchise-altering decision. This is his first ever head coaching hire as a top exec, having inherited George Karl in Denver and Casey in Toronto, and he’s committed to getting it right. That said, it’s expected that the Raptors will have a new head coach in place ahead of the draft, which is scheduled for June 21.